First, I like how these boots are designed specifically for the upland hunter. They’re made for the type of terrain you’ll need to cross when hunting grouse and similar game. The full-grain leather is both durable and scuff-resistant. Additionally, these boots have a Cordura 1000-Denier nylon upper, which adds strength and protection to one of the boot’s largest sections. Like most Danner boots, these include a GORE-TEX inner bootie. It keeps water from soaking through the boot and touching your foot. At the same time, the liner pulls sweat and body heat away from your skin to keep you cool. Additionally, the inside of the boot has Cambrelle lining. It’s an abrasion-resistant coating which helps prevent tearing while also providing an additional layer of moisture wicking. As mentioned earlier, these boots are designed to take you where the grouse live. The Banner Bob outsole works best on soft terrains such as snow, grass, and mud. It’s best for late season hunting when the weather is starting to turn cold, but snow isn’t completely covering the ground. All Danner boots have handcrafted stitch-down construction. It keeps the shoe secure against your foot but also allows for flexibility. Overall, I felt that the boots were rigid enough to protect my ankles and toes but also flexible enough to allow for natural movement. Grouse hunting can involve a lot of walking, but my feet were always pain-free thanks to the air-cushioned insole. They were easily as comfortable as a pair of sneakers. The outer sole has a few different features which help maintain great traction and stability on the soft, slick ground you’ll be walking on. The Danner Bob outsole is air-cushioned and self-cleaning. As you walk, dirt and debris naturally slide off. Plus, perimeter lugs help the shoes grip the ground even when walking uphill in snow and mud. The boots work great on soft terrain. But you should avoid walking on rocky terrain. Rocks and other jagged material can prematurely wear the shoes. Additionally, this shoe is best suited for narrow feet. If your foot is too wide, stability will be affected. A person with a narrow foot will have an easier time moving in these boots. Because these boots are all leather, they need to be broken in. The process should take anywhere from a few days to a week. During the break-in process, you’ll want to wear thick socks to help prevent blisters and other foot pain. These boots are non-insulated. While the leather exterior and Cambrelle lining protect your feet from the elements, the boots aren’t as warm as insulated ones. If you’re be hunting in cold weather, you’ll probably want to wear thicker socks. Note that you’ll want to stick with the same type of socks as consistently as possible. The narrow fit of the boots doesn’t give you a ton of extra room. If your socks are too thick, your feet will likely feel cramped. Plus, thick socks can interfere with the lining’s ability to wick away moisture. Customers are generally impressed with the quality. More than a few customers mentioned how long these boots can last with proper care. Ashley said her boots seemed likely to last at least ten years. Another unnamed customer said he had the same pair of Danner grouse hunting boots for over 30 years! Jesse V said he wore the boots when hunting wild bird in the Appalachian Mountains. The leather was durable enough to handle briar patches and other rough environments. He was also one of a few customers who complimented the shoe’s grip. User DAK said he had no noticeable traction loss even in semi-rugged terrain. The most common complaints are related to the break-in period. Ashley said she had to walk “quite a few miles” before the boots started to feel comfortable. Another buyer said he was never able to break the shoes in successfully. The heel area remained stiff and uncomfortable. Finally, many people mentioned the boot’s narrow fit. Paula M. said she needed a shoe stretcher because she felt the boots weren’t as wide as promised. Theron J. also said the boots were far narrower than the sizing led him to believe. Jeffry P. didn’t mind the narrow size because he liked the boots overall. However, he does recommend ordering at least one size wider than your normal shoe size. These aren’t all-terrain hunting boots. Instead, they’re specifically designed for the relatively soft and slippery terrain associated with grouse hunting. With a Danner Bob outsole, you’ll have solid traction when walking through mud and grass. The full-grain leather construction is durable and lightweight. However, a break-in period is necessary. Your feet will likely feel sore after the first few times you wear these boots. Fortunately, the leather is relatively soft so you should only have to walk a few miles before the boots start to conform to your foot shape. If you’re not a wild bird hunter, these boots are probably not the right choice. But if you are, there’s a lot to like here. 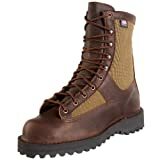 The Danner men’s grouse hunting boot will keep you steady on your feet when pursuing grouse and similar game. The right boots can make a big difference!